When Peg Silloway sat down to write The Cat Lover’s Book of Days: A year of cat history, lore, and laughter, she had no idea she was producing award-winning work. But that’s exactly what she did. "I've always loved the idea of a book of hours; a devotional book people carried with them in medieval days, that had prayers and meditations for each day," says the author. "I wanted to update that concept for our busy digital lives with a book that you can dip into any time and find something interesting that makes you say, 'I didn't know that!' The idea was to make it a book with no time limit, so there is one page for each day of the year, but not any specific year. I wanted to create a book that was positive, fun and full of information." And so she has. 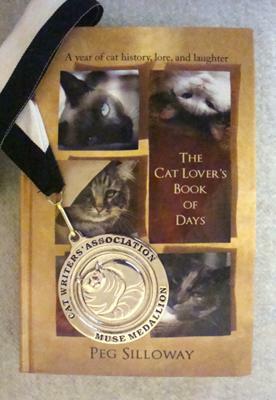 The international Cat Writers’ Association's (CWA) recognized The Cat Lover’s Book of Days with a coveted Muse Medallion for Best Gift Book. One judge found the book "most engaging! Well-researched, nice morsels of kitty-info, quotations, bits and tidbits to urge the reader ever onward. It’s a nice bedside book you can open to any page and be immediately engaged." Peg says, "Part of the fun of this book for me has been learning things about cats that I never knew." And she believes that delight will extend to the reader on every page. Readers can buy The Cat Lover’s Book of Days with a clear environmental conscience and the knowledge that their purchase helps fund care for cats who need it most: The book is printed on FSC (Forest Stewardship Council) certified paper, and a portion of all sales is contributed to Best Friends Animal Society and/or PetSmart Charities to benefit cats and kittens across the country. 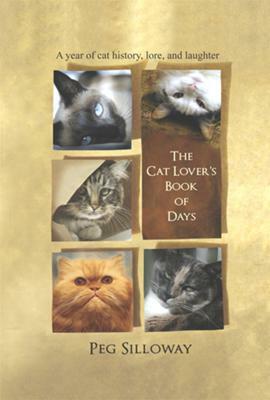 The Cat Lover’s Book of Days is a 384-page, gift-quality 6x9 hardcover with a library binding and is profusely illustrated with photos and diagrams. This award-winning book can be found at Amazon.com and at the publisher’s website at The Cat Lover's Book of Days. Join in and write your own page! It's easy to do. How? Simply click here to return to Cat Book Authors.